A journey across the ideological and literal battlegrounds of the Old World, featuring reports full of dire portent. A specter is haunting Europe: anti-Semitism, nationalism, and all the other tired, old -isms that threaten to crush the ideals of the Enlightenment. In France, a rising right wing threatens to undo continental unity; in Greece, a rising left wing threatens to do the same, adding Grexit and perhaps Frexit to Brexit. Then there are the former Soviet satellites of the East, beset by internal problems and now menaced by a revanchist Russia, acting out with special vehemence in Ukraine. On that note, Foreign Policy Initiative fellow Kirchick observes that during the recent presidential election, there was “an overlap in the aggressive, lewd, trollish Twitter accounts supporting Donald Trump’s presidential campaign and those pushing a pro-Kremlin message.” Then there is Hungary, whose rightist government seemingly wishes to recapitulate the glory days of Miklós Horthy; while the neo-Nazi fringe captures the most attention, “the more insidious menace comes from those wearing a cloak of respectability and who actually hold power.” So it ever was, and so Kirchick, traveling from one hot spot to the next, returns to an overarching and ancient threat. “The sad fact is that, in Europe today, there’s only one group of people who are regularly killed on the basis of their identity,” he writes, adding that when Muslim militants strike there are immediately calls from “right-thinking Europeans” to shun Islamophobia, while there are seldom calls of unity with Europe’s Jews when they are the victims—as they disproportionally are. 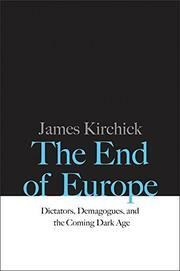 There is little to cheer in the book, for the author writes that a refragmented Europe, diminished on the world stage if not outright collapsed, “means a more dangerous international state of affairs,” where the tiniest spark could lead to conflagration. Students of geopolitics and current affairs would do well to spend time with this book, which, though deceptively slender, contains multitudes.